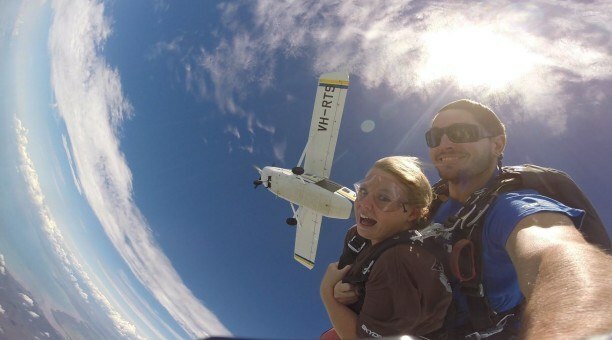 Airlie Beach and Whitsundays is a great fun place for backpackers who want to party, go sailing or relax by the lagoon. 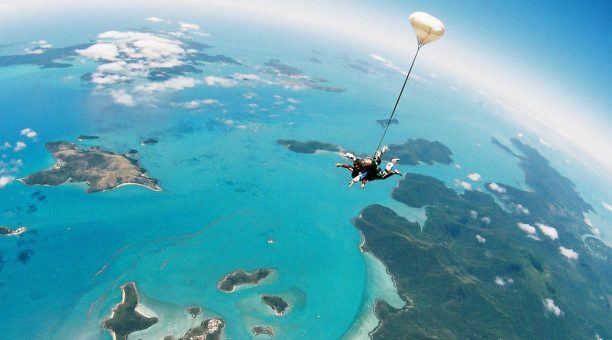 The Whitsundays holds an allure that very few destinations in Australia and the world for that matter can match. As a result it is a place many backpackers make sure they make the most of, yet there are still some who choose not to make the trip to the region or Airlie Beach, which is a mistake you should not make. This archipelago of 74 islands of the coast of northern Queensland has an incredible buffet of white sand beaches, crystal clear water, snorkelling and many uninhabited islands. Whether you stay at Airlie and explore or bunk up on a sailing boat and island hop its up to you, there are no wrong answers in a place of true paradise. And as for Airlie Beach? Well what a spot to lose all that party energy before heading up into calm crystal waters. If you are anywhere near the northern coast of Queensland before wanting to make the trip to the Whitsundays, Airlie Beach is the perfect base to make the jump and in its own right offers a cozy town with great markets and even better night-life. Much like Cairns there is a real backpacker atmosphere here, to the point you may rarely here a local accent. Stroll along Main Street and switch your attention between the shops and the coastline. Swim out the day at the calm man made lagoon or enjoy the use of the free BBQ’s and a dip in the ocean at the beach named, of course, Airlie Beach. This beach turns into a market mecca on Saturday mornings and is well worth seeking out. Night-life in Airlie Beach rivals much of the surrounding regions and as a backpacker town every night of the week is a night to go out and party. Find yourself at a nice bar with live bands before checking in to a more rowdy backpacker bars or even an Irish Pub (yes, they are everywhere) before you know it the mixture of dance-floor grooves and all-night warm weather will have you ready to hit the hay but only at around sunrise. The Whitsundays most popular island and the base of exploration is Hamilton Island, which is easily accessed by plane or helicopter from the mainland or if you are staying nearby on the coast catching a ferry may be a cheaper option and just as scenic! If you aren’t keen on going to all the islands, Hamilton Island is the best spot to take in all the Whitsundays has to offer from just a singular location. 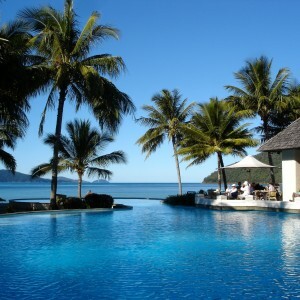 Getting around Hamilton Island is easily done on foot as everything is within walking distance. There is something so sweet about being able to travel through the rich green trees and along the undulating hills as you look down to the clear blue water and even bluer skies above. The islands other form of transportation is the trusty golf buggy and is a fun way to get around the island and even explore the northern corner which offers some great views. On the Catseye Beach side of Hamilton island, sit back and watch the tide go right out to sea or partake in various activities like hiring an outrigger or go beneath the surface with a snorkel and mask and take in the sea life. Over on the Marina side there are restaurants, bars and you can even go jet skiing or enjoy a scenic helicopter flight. For more thrills check out the islands fantastic go-kart track, ATV or Dent Island’s picturesque 18 hole Golf Course. As the sun falls this is when the islands real beauty comes out of the shadows and presents a show for the senses. Take in the rich ambers at One Tree Hill which offers sunset drinks or at the Bougainvillea Swim Up Bar flanked by palms trees. Either way make sure you’re somewhere to take in the sunset, a true Whitsundays gift. The drinks continue to flow at Boheme’s Nightclub which is located just past the Hamilton Island Marina. Soak up the late night tunes and take the party into the morning hours. The Captain’s Club is another great place to kick back and enjoy a neat view. Ok so you had a few to drink and made some hasty plans to travel to some of the other islands just into the distance. Its ok, in a utopia like this there isn’t much chance you can go wrong. There are so many awesome spots to explore throughout the Whitsundsays’ and discovering each one and its own intricacy that sets it apart from the rest is what travel is all about. 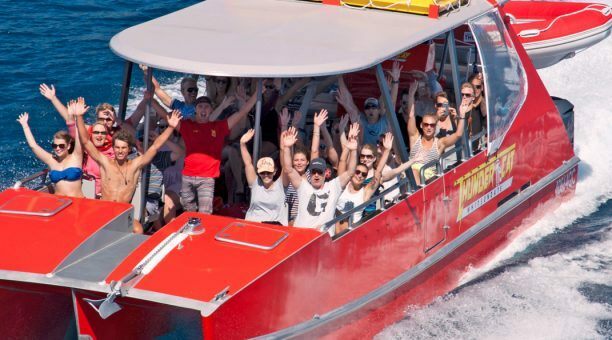 The best way to make the most of each island, snorkel spot or hidden cove is to get your mates together, hire a sailing boat from Airlie Beach and explore. 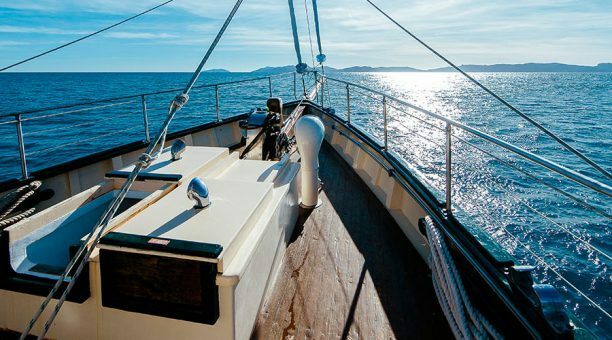 You can either charter a boat with a skipper or bareboat charter – you dont need experience or a boat licence! The bare boat briefers provide all the training required. Calm waters aside the seas can swell at certain points to become rough and really who would want to risk it? So kick back and relax, open a six pack and enjoy the view as you float by. 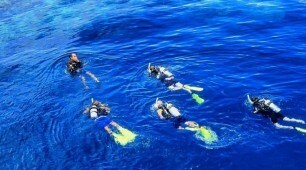 Tour packages and other easy ways to get you staring out into the endless ocean are available throughout this site. First stop should be Whitehaven Beach which is an easy day trip from Hamilton Island. This seven kilometre stretch of pure white sand is what we imagine a beach would look like in heaven and is very popular with tourists and roaming sailors alike. But the expanse of area allows you to find your own private piece of beach nirvana. If you fall in love with this place as many have been known to do, throw down the anchor just around the corner at Tongue Bay and do the short bush hike to the famous swirling sands of Hill Inlet lookout. Nara Inlet which cuts in to Hook Island is one of the Whitsundays best anchorage spots. The inlet is calm and often quiet enough for you to simply dive off the end of the boat and swim, or sit back and take in the sunset in peace. If you are lucky you may even spot some whales with their new born calves as you sail towards the inlet. If you have time drive the dingy inland to check out the Aboriginal scriptures and paintings for a special insight into indigenous culture and history. 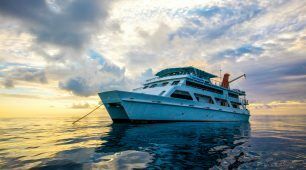 As you sail around there are many fantastic snorkeling spots and whether you are just going for day tours or on a larger sailing expedition it is best to keep an open mind and go with the flow. 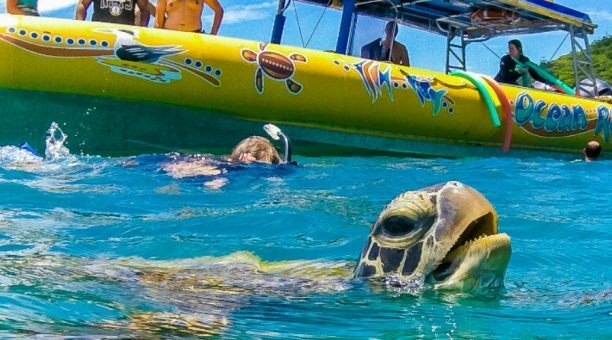 Be prepared to make unexpected stops to check out the stunning scenery or if you sail past Gary’s Lagoon or Blue Pearl bay to jump off the boat and explore some of the Whitsundays best snorkel spots. 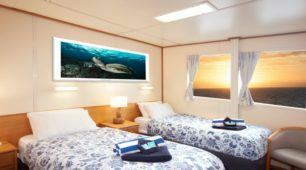 There are many locations that match even the beauty of the Great Barrier Reef itself. The Whitsundays combines the beauty of reefs with endless beaches, rich green rainforests and a sweet collection of action packed fun. From sunrise to sun fall you will find yourself amongst one of the world’s most magnificent locations and how you spend it is up to you, but you will struggle not to get swept up in it all.